An automated storage and retrieval system, with a WES chaser, keeps distillery operations flowing. Outdated storage systems and technology can leave those involved in the business of making popular alcohol with a hangover that never seems to end. With the booze business booming, Buffalo Trace Distillery knew it had to update its storage and retrieval practices if it wanted to keep product flowing on time for its customers. Buffalo Trace Distillery, a family-owned company based in Frankfort, Ky., dates back to 1773. As a fully operational distillery producing bourbon, rye, and vodka on site, the company has garnered more than 300 awards—including Brand Innovator of the Year at the Whisky America Awards 2015—for its wide range of premium whiskies. With nearly 250 years of experience to call upon, Buffalo Trace knew it was time to update its systems to stay ahead of the game. The company was using 240,000 square feet of storage space spread across seven decentralized locations and one contractor location. Most of the space consisted of bulk storage with limited racking systems. Pallets weighing 2,000 pounds were often stacked two-high, which resulted in damage if they sat too long. Westfalia's Satellite technology, which provides the ability to maximize storage density with variable-depth storage lanes. Savanna.NET, a warehouse execution system that seamlessly integrates the AS/RS with Buffalo Trace Distillery's enterprise resource planning system, enabling real-time inventory accuracy and streamlined order processing. 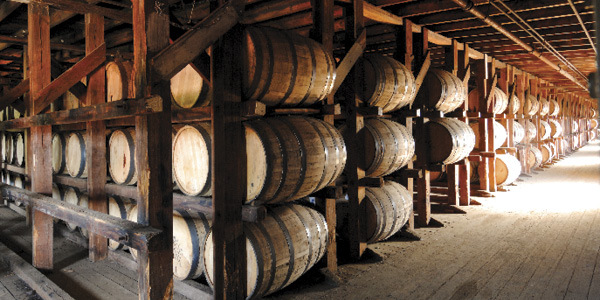 Buffalo Trace Distillery's products are securely stored. All pallets are triple-supported within the rack structure, eliminating pallet deflection/breakage and product loss.